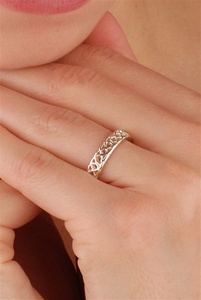 This unique ring features the Lover's Knot wrapped around the entire ring. I have several rings from Claddagh Ring and like the others this one is well made and true to size. They also provide very fast shipping which is great. I love this ring! Have received so many compliments. the workmanship is lovely, very simple yet elegant design. Heavy and beautifully made ring. I would highly reccomend CladdaghRing.com. Great quality for a very good price. Quite pleased with the product. Liked the design and weight. Rapid response from order to receipt.